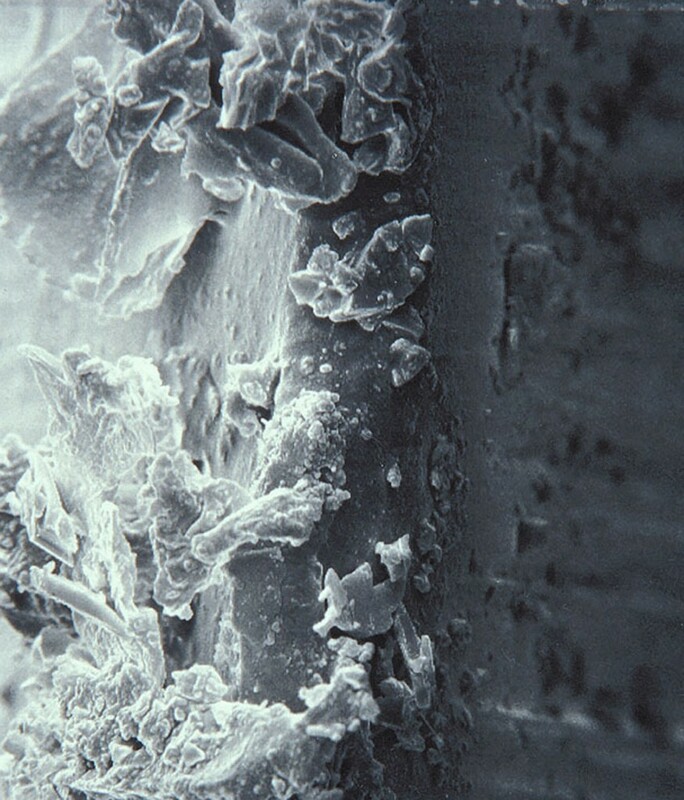 This is a still from the Knife Kiss video featuring a scanning electron microscope view of a zoom-in progression into the cutting edge of a kitchen knife. The viewer travels straight into the knife’s edge to the point of an imaginary touch coinciding with the end-limits of the microscope’s vision. The knife’s “kiss” is the point of scientific blindness. Like Knife Name (Maiden), the Knife Kiss video combines the mastery of scientific “seeing” with ordinary tools and domestic speech. Special thanks to Alicia Thompson, Center for Electron Microscope and Microanalysis, USC, for providing access to and training on the SEM, and overall enabling my work at CEMMA. I am also grateful to David Yamamoto, Photography Lab Manager at USC (2001) for helping me capture the video for Knife Kiss.